Get lean, build muscle, and stay healthy in only ten minutes a day! A Fitness Hall of Fame inductee and world-famous exercise scientist explains the #1 new fitness trend and how to get and keep the body you've always wanted. HIIT was recently rated the #1 new fitness trend by the American College of Sports Medicine and is the key to staying fit for celebrities like David Beckham, Britney Spears, Hugh Jackman, and Scarlett Johansson. In addition to fat loss, it's been proven to have major health benefits on blood pressure, diabetes, and cholesterol. Through this groundbreaking volume you'll learn why, and see how to get fit quick, and have a fun and a truly sustainable exercise program, no expensive personal trainer required. "HIIT Your Limit is packed full of useful advice on living a healthier, fitter life and Dr. Kravitz's zeal will inspire you to make small changes that lead to huge results!" "Here you're getting the very best: unlimited great ideas that are simple to implement to really get results!" "Dr. Kravitz is an international leader in the health and fitness industry and has a gift for making the science of exercise make sense!" "HIIT Your Limit is the perfect read for anyone and everyone looking for a motivating guide to exercise right and eat healthy for lifelong wellness." "Dr. Kravitz is a legend in the fitness industry. 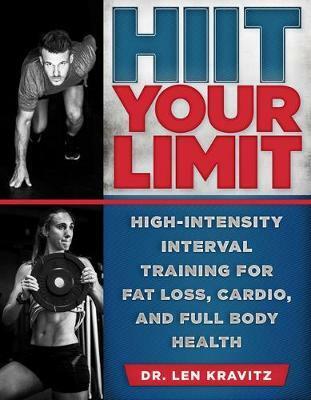 His new book, HIIT Your Limit, will get you moving and take you to YOUR limit!" "Dr. Kravitz has a way of taking decades of exercise and nutritional science and bringing it to us in a concise and incredibly useful way. I recommend that all my patients read HIIT Your Limit, digest it, and exercise this resource for a healthy life!" "Following this program of diet and lifestyle changes can help you lose and maintain weight, in addition to helping you live a longer, more vibrant life in the optimal amount of time."